National Relief Charities (NRC) is a nonprofit dedicated to quality of life for Native Americans living on remote and poverty-stricken reservations in the Plains and Southwest. 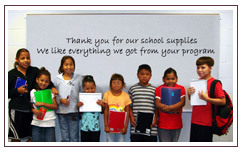 Established in 1990, we are the largest Native American-serving charity in the United states. Our mission is "Serving immediate needs. Supporting long-term solutions." The NRC brand and NRC programs are popular among donors and Program Partners. But the talent behind the brand is an integral part of our offering. Our core values stress that “our employees are the source of our strength.” We could not do what we do without their passion and caring hearts for making a difference in Indian country. NRC employees often possess these traits: a passion for our mission, a recognition of the injustices in American Indian history, an awareness that American Indians are underserved in the US, enthusiasm, professionalism, and solid skills in their field or specialization. There are many industry experts among us. I like the way we support the reservation’s self-determined goals. We don’t tell anyone what to do or how to do it. Many have done that before — it got American Indians to the conditions we see today. I like coming to work and knowing that I make a difference every day. Knowing that it helps someone who is Native American is even better. I love the fact that we are working to help people here at home. So many dollars go overseas to help people there, and I’m sure they need it. But so do our people. The injustices suffered by American Indians and what was taken can never be repaid. At least now I can help give something back. At NRC, I get to do what I love and be the best I can be! That keeps me going. National Relief Charities is Equal Opportunity Employer. We do not discriminate in any aspect of employment on the basis of race, color, religion, gender, gender identity, age, national origin, disability, citizenship status, sexual orientation, veteran status, marital status, ancestry, pregnancy, ethnicity, or any other legally protected status in accordance with the requirements of federal, state, and local law. NRC is a DRUG FREE workplace.